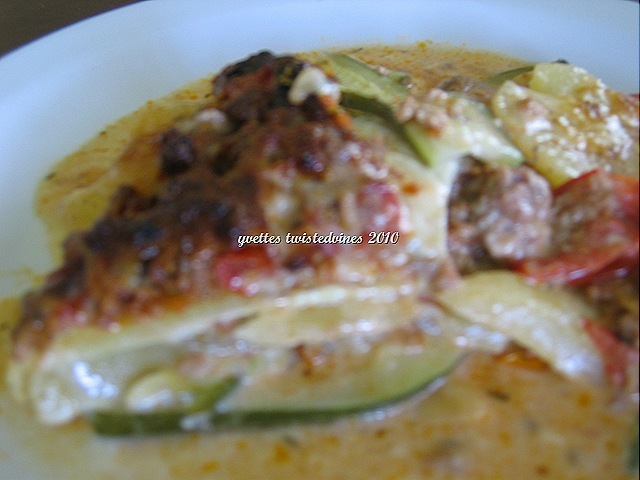 This recipe is a variant from the normal Greek style moussaka. 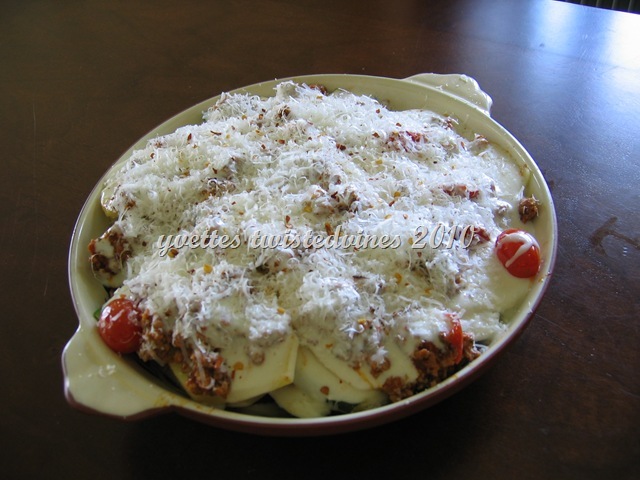 The main ingredient used in traditional moussaka is aubergine, or eggplant parmesan here in Italy. 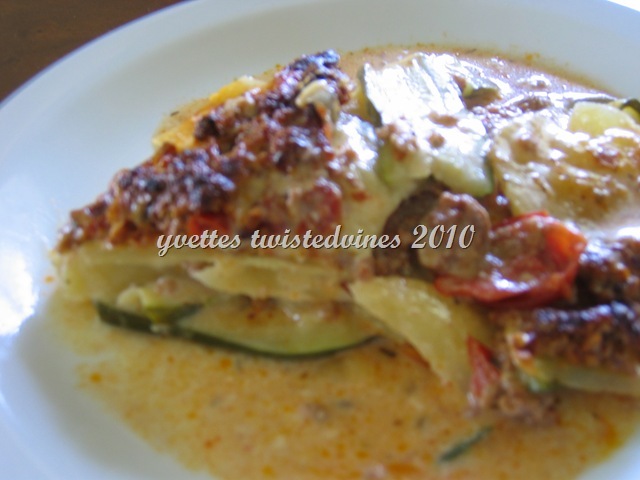 This moussaka is light,and a pleasant change, to the normal heavy tomato based moussaka. In a frying pan, heat 3 tablespoons of olive oil, add garlic, cook until transparent, add ground mince and cook for about 15 minutes until brown. Add cherry tomatoes, oregano and a generous amount of ground nutmeg, simmer until cooked about 30 minutes until liquid has evaporated.Turn off heat. 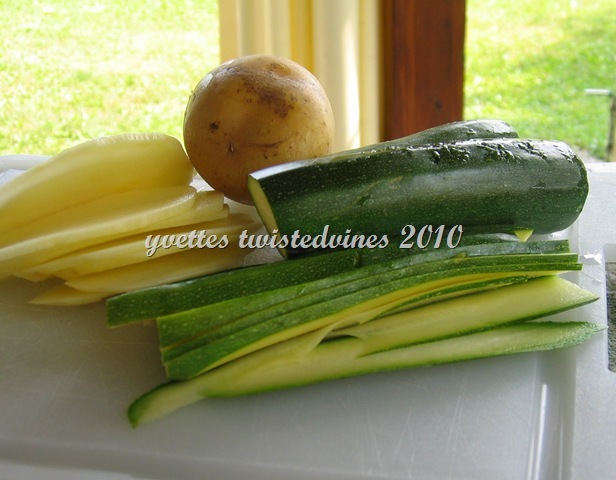 Steam the zucchini for 2 – 3 minutes, slice long ways.Slice also the potato (raw) in thin slices. Prepare the béchamel sauce. Heat the butter, until melted. Turn off heat.Stirring continuously, add the flour and mix well forming a paste. 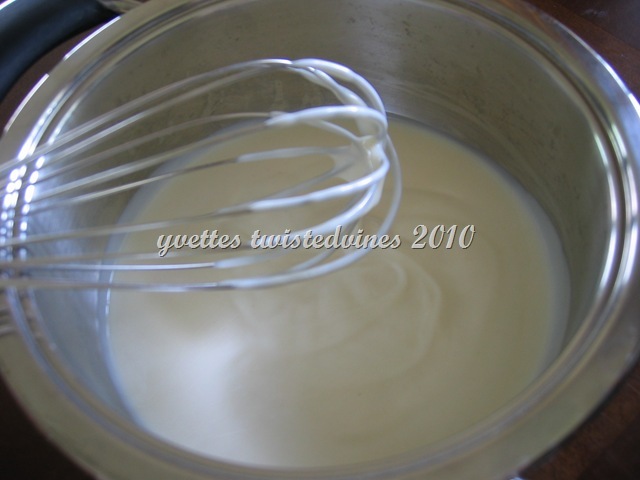 While off the heat add the milk, stirring with a whisk. Dissolving the flour and whisking until there are no lumps. Place back on heat again, cook until thickened,bubbly and a creamy texture. If you make the béchamel sauce this way you shouldn’t have any problems, your end result will be creamy (no lumps) white sauce every time. The trick is to take the butter and the milk off the heat. 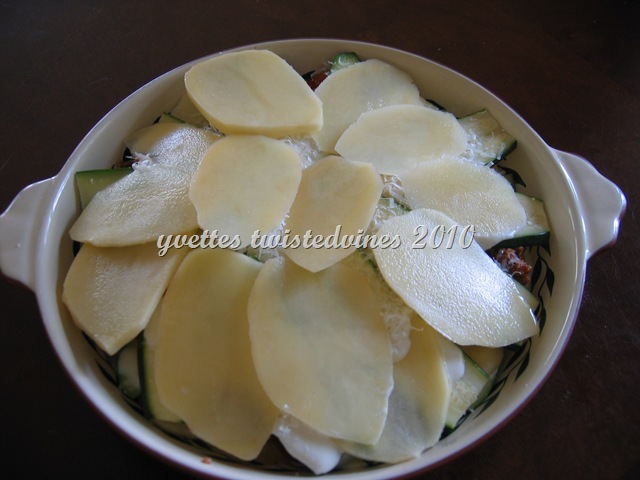 Now, we’re ready to start layering.Using a casserole dish, start layering, first the meat mixture,then a layer of zucchini slices, add parmesan cheese, a layer of potato slices, add parmesan cheese,add some béchamel sauce.Repeat. For the final layer end with a layer of meat, béchamel sauce, a generous amount of parmesan cheese, and optional, add freshly grounded chilli flakes. Cook in oven for 20 – 25 minutes, testing that the potatoes are soft. A liquid sauce will form due to the water content of the zucchini. So it’s important to cook the meat sauce until all liquid has evaporated. Lunch is ready my friends. !This is a meal on it own, served nicely with a chilled glass of white wine. Looks like total yumminess to me! 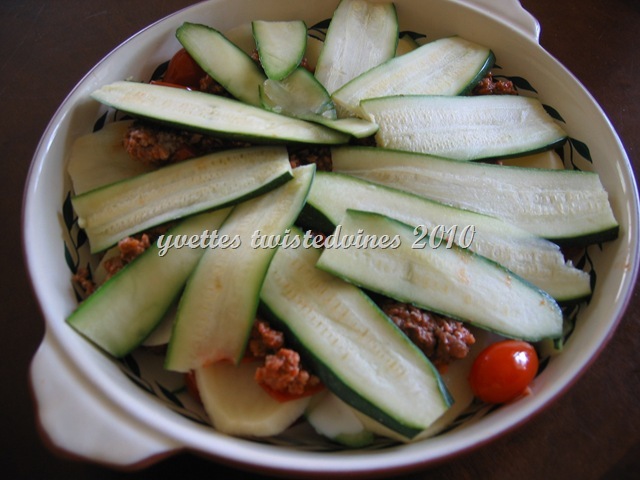 This is the dish I am going to make when I harvest the first zucchini from the garden! I might just give this one a go, as we have heaps and heaps of home grown zucchini at the moment.